Magento provides different payment methods in order to allow you to accept payments using different payment processors like Paypal, Authorize.net and many more. 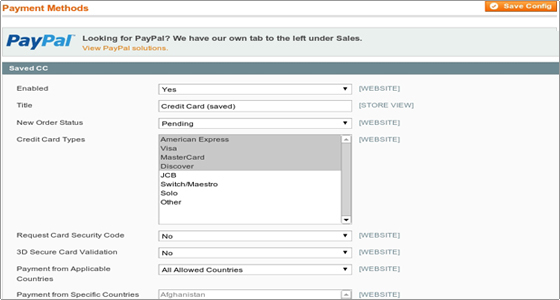 To configure you payment methods in Magento, first you need to login to your Admin area. 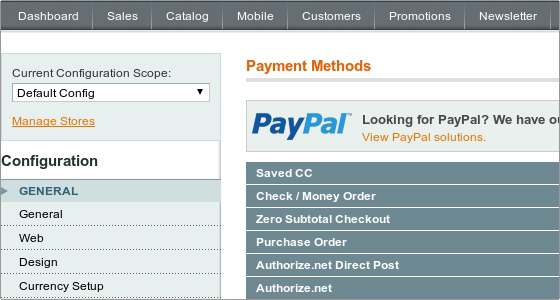 Then, go to System -> Configuration -> Sales -> Payment Methods. Enable the method, enter its title, set the new order status, pick the supported credit cards, decide whether the credit card verification is required, define from which countries to accept payments and the range of the accepted payments. In the Sort order field you should enter the position of this payment method compared to the other payment methods offered to the customers. That's it, you have just enabled this payment method for your customers. Since all payment methods have different configurations, we cannot explain in details how to configure each one of them. Simply follow the instructions on their specific pages and they should work. © 2015 BAKEROP. ALL RIGHTS RESERVED.